Tennis legend Bjorn Borg says old rival John McEnroe convinced him not to auction off the five Wimbledon trophies he won between 1976 and 1980. 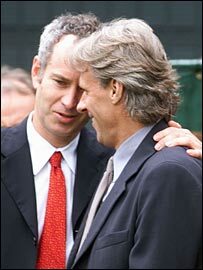 Borg also planned to sell two of his famous wooden racquets, but said calls from other tennis stars made him think. "Then when John McEnroe called me several times and wondered what I was doing, I guess I woke up," he told Swedish tabloid Expressen. The silver gilt trophies had been expected to fetch up to £300,000. Borg, who retired at 26, is reported to have established a £40m fortune during his career but has since been through two divorces and a bankruptcy. He had planned to sell the trophies and racquets at an auction of sports memorabilia in London in June to secure "financial security" for those close to him. One of the racquets was the one Borg used in his classic victory over McEnroe in the 1980 final. I promise one thing - these tennis things will never be sold - Never! Borg, who won 11 Grand Slam singles titles in a glittering career, denied that he was in any financial difficulty. "I am not poor at all. Business is going great and I have nothing to complain about," he told Expressen. "I guess I was tired of seeing the old stuff lying about here in the house. Maybe I thought they could bring joy to other tennis enthusiasts. "I didn't think it through. Today I regret it. Clearly McEnroe convinced me." The Swede now has to buy the trophies and memorabilia back from London auction house Bonhams, but has refused to reveal the price. "Maybe there will be some exhibition somewhere, sometime," he said. "But I promise one thing - these tennis things will never be sold. Never!"